In the time before Walmart and department stores, when people needed metal goods, they went to see a smith. A gold or silver smith for jewelry. A coppersmith for a pan. A blacksmith for iron goods. When the pan got a hole in it, folks would set it aside and wait for a tinker–a traveling tinsmith–to stop by and make a repair. In the pre-Industrial world, the foibles of different kinds of metals took many kinds of specialists. There are also many, many ways to work with language, to be a word smith. Many of us begin our apprenticeship into the word pounding business with our eyes set on the most visible of writing crafts: fiction novelist. It’s a great job, right? But it’s not the only way to wield words, be a part of the writing community, and make money. You have an almost dizzying array of options. Ready to be dizzied? Look to your right, at the Inkpunks Roll Call. These 8 folks hold down a pretty reasonable variety of writing jobs. Adam is a slush reader and Creative Director for a genre magazine. Christie is writing 2 novels, creates short stories, and serves as the Assistant Editor of a science fiction magazine. Erika reads slush for a magazine and edits anthologies with Jaym, who is also the Editor of a magazine, and both write fiction when they can. John Remy writes short fiction and graphic novels. Morgan (that crazy graduate student!) is a slush reader for the same magazine as Erika, when she’s not cranking out novels and short fiction. Sandra is primarily a novelist, but you can buy her fitness manuals on Amazon. Then you have me. I decided at some point that I didn’t really know what I wanted to do with words, I just really, really liked them. So I decided to test-drive a bunch of different things. I’ve sold a poem, a novel, an article about parasites, and short stories. I’ve been an anthologist’s editorial assistant and now I’m the assistant editor of a genre magazine. That’s like six different writing jobs and I’m still not sure what or how or if I want to specialize. I just know that by trying lots of different writing activities, I’ve opened more and more doors and seen just how wide the net of word-smithery can spread. That’s the wonderful thing about our field. All of us Inkpunks are nutty spec fic folk. It’s a small genre, really, compared to the rest of the writing industry. But within just our little corner of the writing world, we’ve found dozens of fascinating and fulfilling writing-related activities. It happened by volunteering and asking questions. It happened by saying “yes, I am willing to be an apprentice to this craft.” It happened by being willing to set aside what we though we knew about writing–and just opening up to the field. Some day, we’ll have found that we’ve become specialists. Goldsmiths, coopersmiths, tinkers. Someone will be an expert editor. Someone will be a full-time novelist. But after our time as Apprentice General Word Smiths, I think we’ll never lose our appreciation for all the other writing jobs. There’s no one best job in writing. Being an editor isn’t better than being a novelist. Being a poet isn’t superior to being a journalist. Words, no matter how they are shaped, can not stand alone. There’s a picture at the top of this post. 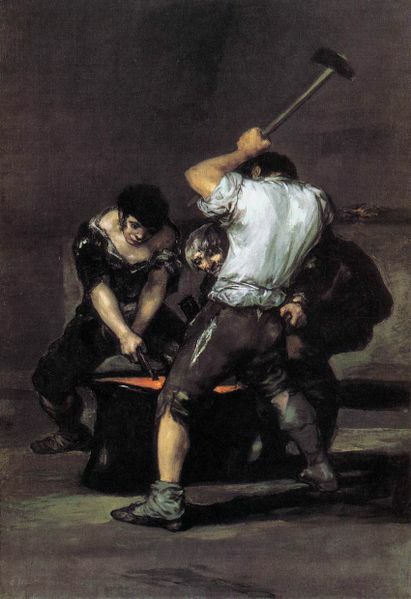 It’s Goya’s painting, The Forge, and you can see three workers standing around that anvil. One’s probably a novelist, ready to hammer out the hot inspiration. The serious older guy is probably an editor, seeing the shape of the story and urging the novelist to make careful choices. And the big strong kid with the huge eyes? He’s the apprentice, soaking up every word with wonder in his heart. I feel like I’ve learned so much from interning (thanks Jennifer Brozek! ), editing, and slush reading. From what editors actually do, to what makes a story stand out, to wonderful examples of professionalism by authors, lessons from the non-writing side of the writing business have been invaluable. I believe they will make me a better writer in the long run.